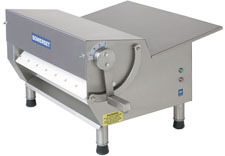 New Somerset Dough Sheeter-The Ultimate Sheeter! The most versatile tabletop sheeter available. Sheets dough to a uniformed thickness in seconds. Perfect For Cinnamon Rolls, Yeast Raised Donuts, Pizza, Pastry Production, Pasta, Dough Lamination, Pie Crusts! Great For Bakeries, Donut Shops, Hospitals, Schools, Pizzeria's, Restaurants, Institutions! S/S Construction-USDA Approved. NSF, UL, SA, CE APPROVED. Rollers are 3.5" diameter by 20" Length. Shipping Weight is 150 lbs.